DTH operators, Dish TV and D2h, are trying to grab consumers attention by rolling out new offers every now and then. Earlier D2h launched long-term recharge offer and providing up to 150 days of free service to the subscribers. 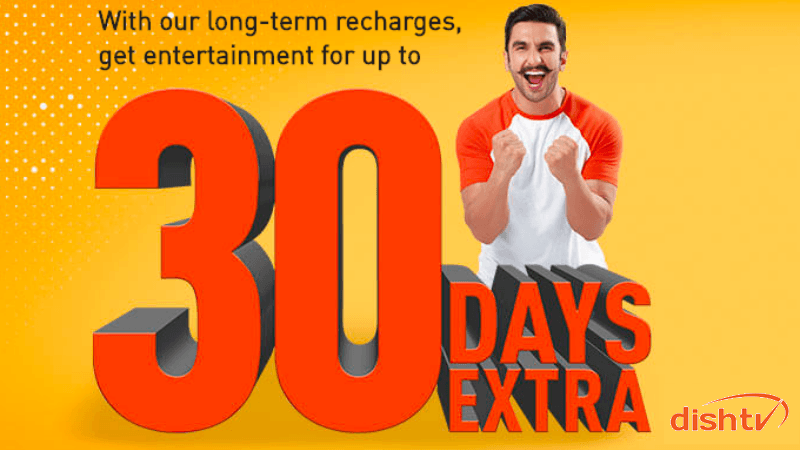 Now, Dish TV has come up with a similar offer; Although Dish TV is not providing a bonus subscription of five months, it is giving 30 days of additional recharge for free. Dish TV subscribers choosing a plan for 11 months or above will be eligible for 30 days of extra service for free. To recall, D2h is giving an extra five months of service on recharging the same plan for 55 months. At the moment, Dish TV users can avail the bonus subscription offer by recharging via the company’s website or mobile app. Also, there’s no info on when Dish TV will pull off this offer. It is worth noting to enjoy the benefits of the long-term plan subscribers will have to buy a subscription of Dish TV for at least three months after which they will get seven extra days added to their credit. Next up, on purchasing a long-term subscription of six months, they will get to enjoy 15 additional days of DTH subscription. Further, Dish TV has announced that users who buy a long-term plan of 11 months or more will get one whole month free or 30 days worth of extra days on their plan. These subscribers will also enjoy an additional benefit of one free service visit. This add-on would mean that if you take a long-term subscription plan of 11 months or more, then you won’t have to pay for one service visit in case you run into some trouble with your connection during the subscription period. It is also important to take note of some points which Dish TV has noted about the new offer. The DTH provider has clarified that the long term plans will only be valid with the new tariff channels and channel packs. It is worth noting that D2h subscribers are going to enjoy similar benefits on buying long-term plans, but they will have more choices in this regard. While the benefits of long-term plans will be capped at 30 days for Dish TV users, D2h users will also be able to avail much more extra days of subscription. Apart from the above mentioned three slabs, D2h users will get 60 extra days on 22 months subscription, 90 days on 33 months subscription, 120 days on 44 months subscription and 150 days on a long-term subscription of 55 months. Also, both D2h and Dish TV have launched an all-in-one pack for their subscribers keeping the cricket season in mind. The platforms have launched a service which the subscribers will be able to buy over their existing channel selections. Using this service, they will be able to watch all three formats of cricket – ODI, T20 and Test matches. This service has been named ‘India Cricket Service’ on Dish TV and ‘India Cricket’ on D2h.